Haas F1 Team has revealed its livery for the 2019 F1 season which is inspired by its new title sponsor Rich Energy. Like 2018, Haas is once again the first F1 team to reveal its livery for the new season as the American outfit presented a brand new combination for the team in an online launch as it takes up the colours of Rich Energy – who are their title sponsor. 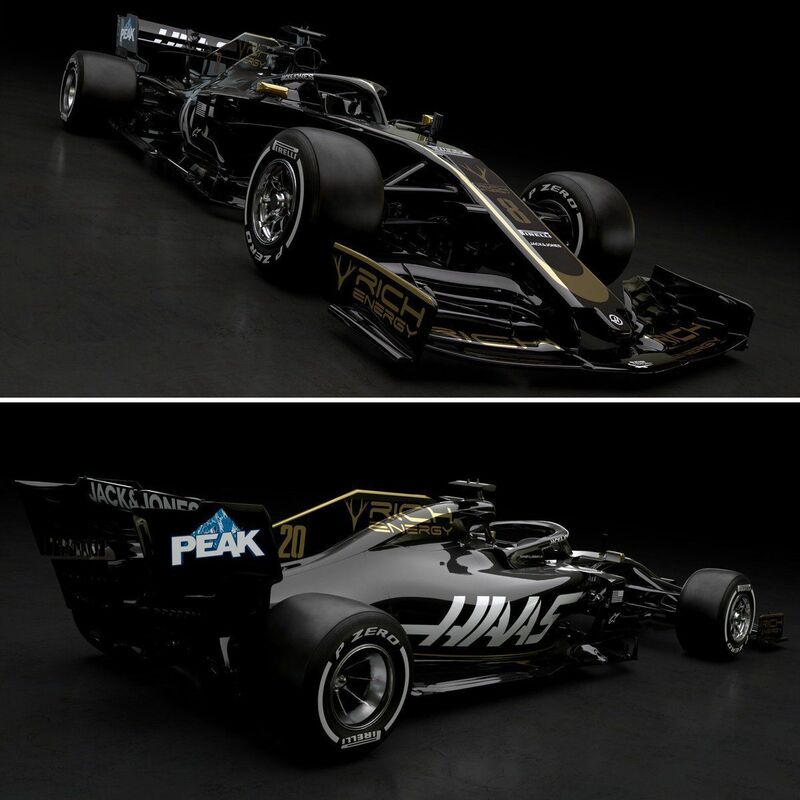 They move on from the traditional red, white and grey combination to black and gold which is the colour of Rich Energy. The team kit also sees a change as it goes black with the drivers’ overalls of Romain Grosjean and Kevin Magnussen reflecting the same. “This is the time of the season when you hope you’ve got designs right and you can be competitive straight away,” said Gene Haas. “The new car looks distinctive, not only in terms of its color scheme, but also with the new regulations in play. “It’s important that we keep progressing as a team, and this season is no different. Our partnership with Rich Energy is another positive example of moving forward as an organization. We’re pleased to see their colors on the VF-19. “We welcome them as they join our valued partner group in utilizing Formula One as a global marketing platform. While 2018 delivered our best season to-date, the year showed, sometimes sharply, that we still have areas to improve on as a team. 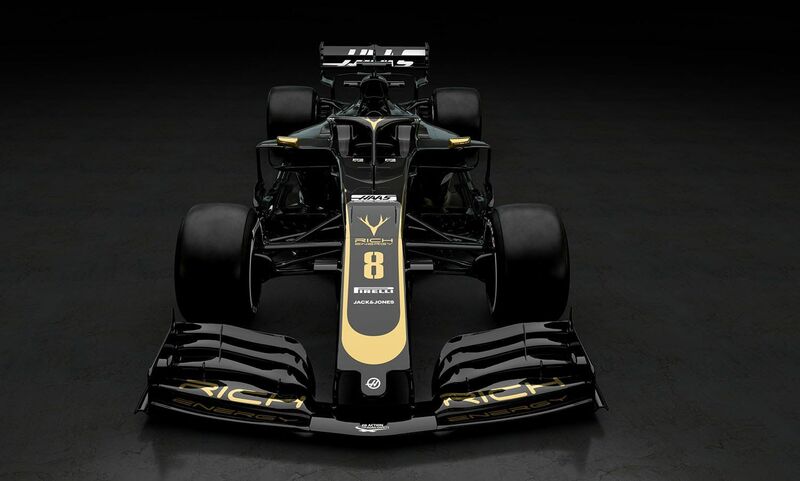 “I’m naturally delighted to finally see the Rich Energy colors and stag logo in Formula One with Haas F1 Team. Partnering with the team has already significantly raised the profile of our brand, this livery unveil will again elevate us to another level. The VF-19 photos carries the new front wing design and other changes including a smaller rear wing and new type of tyre rims. The physical launch of the final 2019 Haas car will take place on February 18 at 8AM Barcelona time on Day 1 of the test. Haas surprised the F1 grid in 2018 with its performances as it fought against Renault for fourth until the very end stages but had to settle for fifth in the constructors’ standings, which is their best result till date in the three seasons they have competed in. The idea will be natural progression in 2019 but they will have stiff fight as the likes of Renault, Racing Point, Alfa Romeo and Toro Rosso could pose a challenge while one can never discount what McLaren and Williams can bring to the table.